Now, 12 months later, I can say that I’m in the same boat. I won’t be able to make a dent in my WIPs until my boys are back in the classroom. And even then, there’s a new baby—a fur baby!—scampering around From Bolt to Beauty world headquarters these days and laying claim to much of my time (more on her in a future post). Is there any hope for my long list of projects? To prove to myself that I will, in fact, get something finished in the near future, I looked through those WIPs from last year. Of the six projects that accompanied my pitiful poetry, I finished four! Not too bad, right? I’m counting a fifth finish, too. 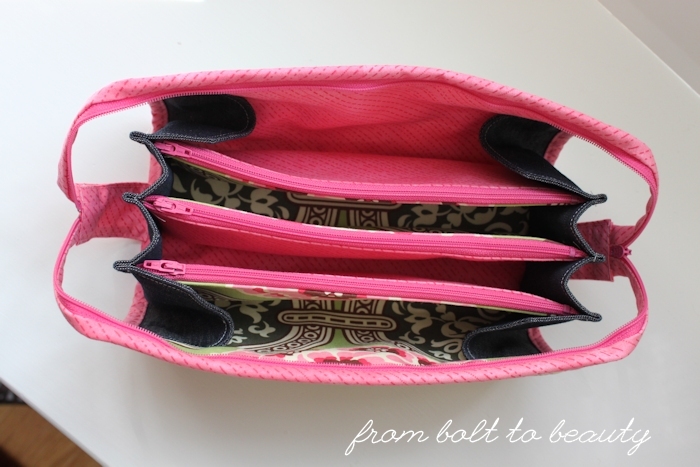 I had extra fabric from the eggplant Cosmo Bag and made this Mini Miranda Bag with it. One of the yet-to-be-finished projects is Park Bench, a block-of-the-month (BOM) quilt from Jaybird Quilts featuring Carolyn Friedlander’s Botanics line. I have done absolutely nothing with that WIP. Actually, I’ve decided that I’m not much of a BOM girl. 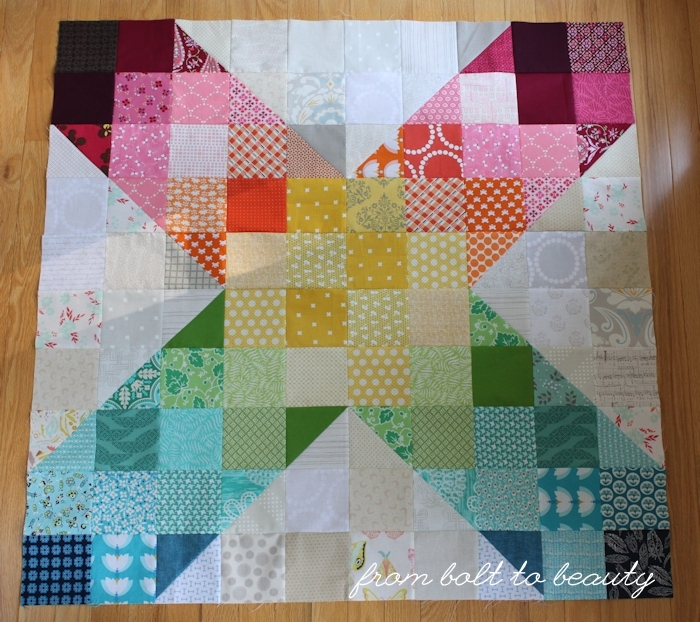 I like BOMs in theory—work a little bit each month and have a finished quilt top in the end!—but I’m not fond of spreading a project out over many months. I’m going to wait until my sewing schedule frees up and devote time to wrapping up Park Bench in short order. 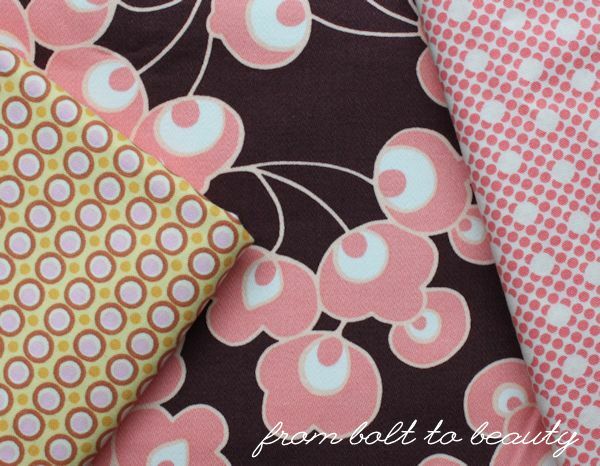 Then there’s this brown and salmon Amy Butler fabric (see pic below), which I wanted to make into a bag last fall. I still want to make it into a bag, and I’m leaning to lining the bag with the Scrumptious fabric on the right. (Who knew that Amy Butler’s designs could play well with Bonnie and Camille’s?!) The reject, on the left, is also from Amy Butler, but it doesn’t do it for me in this project. I’d like to make a beach bag with my selections, something simple but roomy. The challenge now is mustering some enthusiasm for making a bag that likely will not be used until the summer of 2016! OK, it’s time to come clean: Are you excited about the new school year, too? If your response is something about having an empty nest or not having embarked on parenthood, are you available for babysitting?! About every other month, my husband travels for a week for business. Instead of dreading my time as a single parent, I’ve learned to embrace these trips. In the days leading up to my husband’s departure, I anticipate the small perks of a week without him: enjoying a clean (boy-free) master bathroom, preparing simple kid dinners instead of nicer ones, and being selfish with how I spend my evenings (i.e., by sewing). When my husband revealed that he would be traveling for two full weeks this summer, however, I promptly curled up in fetal position. After all, there’s no school during the summer! There’s no structure! That’s a lot of free time for one mama and her two little boys. Then it occurred to me to find the silver lining in the situation—or create it myself, if necessary. And I did. 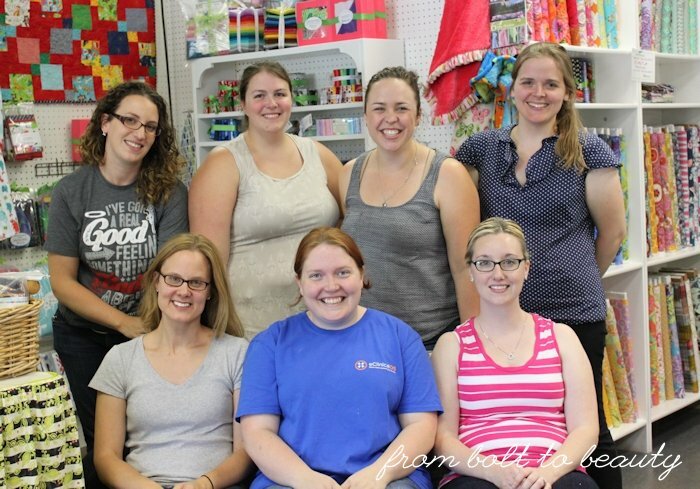 During the weekend that my man was out of town, I invited some quilty ladies to join me for a day of sewing at Quilter’s Way, my local quilt shop. Summer weekends can be tough to schedule, so I was psyched to round up a group of seven of us. And here we are. 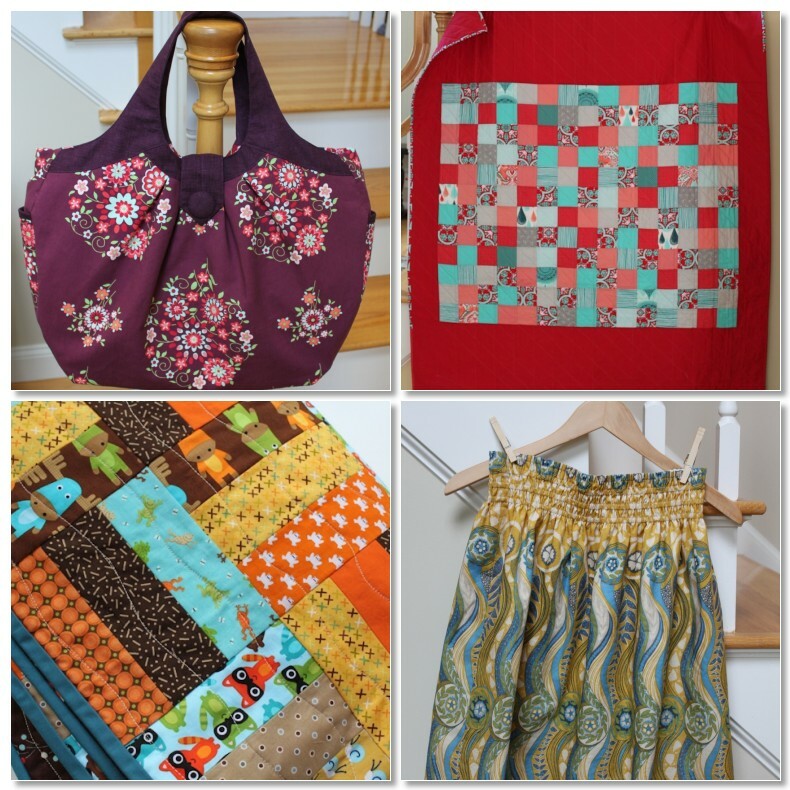 Top row (left to right): Terri of Childlike Fascination, Mary of See Mary Quilt, Jenn of Never Just Jennifer, Caitlyn of Salty Oat. Bottom row (left to right): me, Sarah of Smiles Too Loudly, and Beth of both Instagram and Munchkin fame. The sewing studio was ours for the entire day. We sewed. We laughed. We ate. We bought fabric. The day was perfection. In between oohing and aahing over each other’s projects and fending off the siren call of the Munchkins Beth brought, I made a few mental notes about the experience. 1. Sharing a common passion goes a long way in developing friendships. I have my mom friends, my church friends, my college friends—and just like those other groups, I have a connection to these sewing friends. We may be in slightly different stages of life (damn, I was the oldest in the group again, Karin—and by more than 11 days! ), with different interests outside of sewing, but I think it would be impossible for us to get together and not have fun. Quilty friends are the best. This is one quadrant from my Obsession quilt, which I worked on at the sew-in. It’s not done, but I got a good chunk of piecing completed. 2. People have different processes. 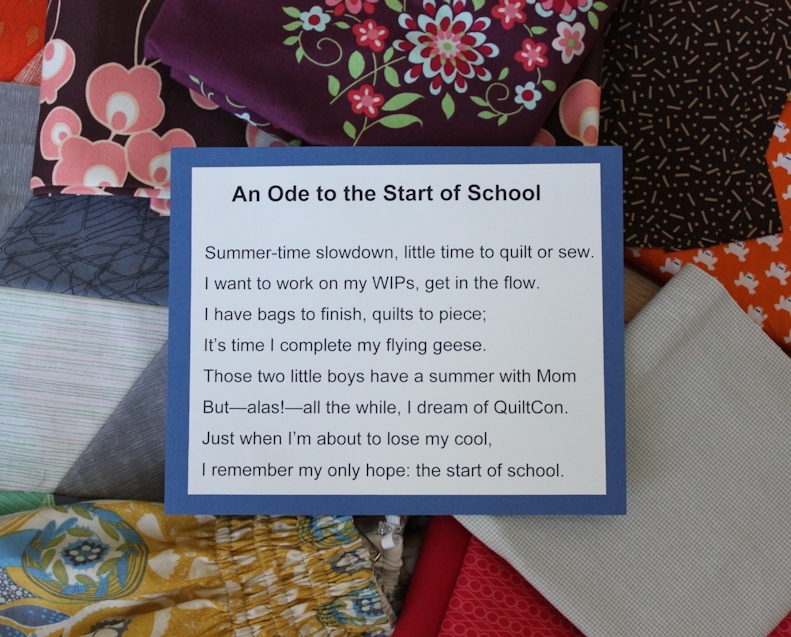 It’s interesting to see how different quilters approach their creative process. For example, some in the group are unfazed by having dozens of concurrent WIPs; others have just a few (and resort to the aforementioned fetal position when the WIP count gets above six or seven). Inviting others into our creating space is a worthwhile exercise, but it’s harder than I thought it would be. I mean, I’ve gotten feedback before on how I should quilt something or how I should bind something. It’s different, however, to lay out my plan for a project with just a few fabrics and pictures to help someone else understand my nascent vision. Even the process of trying to describe where I’m headed helps, though; it makes me fine-tune my plan. 3. It takes a long time to piece a quilt top. I mean, really long! I brought two in-process tops and finished neither of them. Don’t get me wrong—I made some good headway. But I usually sew in small increments at home. When I can actually account for the time I put into a quilt, it’s a lot! 4. When I label my quilt pieces and write notes to myself, I make fewer mistakes. (Duh.) At the retreat I went on back in April, I made one bonehead mistake after another. Maybe it was the sheer number of hours I spent sewing or the cocktails that were consumed each evening—I don’t know. I was more conscientious at this sew-in and didn’t use my seam ripper once. Woo hoo for efficiency! And despite those snafus from the spring, April Michelle wrote some helpful notes about where August Michelle should pick up with her Obsession project. August Michelle was very appreciative. Woo hoo for thinking ahead! When I got home after a day of sewing, I sewed these strips. I am excited about how this wintery quilt will turn out! I left the day physically exhausted but renewed in other ways, and I funneled that energy into the days with my boys that followed. I still have a few more sleeps before my husband returns, and I think I’ll be able to stay afloat. So far, there has been no bloodshed, no broken bones, and only a modest amount of yelling and frustration (from all parties present at my house). There was one morning when the guest-room alarm clock mysteriously went off at 5 a.m., waking my older son, who woke me. Sigh. I can’t figure out how it was turned on. My son blames the tooth fairy, who visited that same night. As the resident tooth fairy, I assure you, it wasn’t me! When I started sewing 12-plus years ago, one of the designers I was particularly taken with was Amy Butler. At the time, she had just a fabric collection or two under her belt, and her lines were exclusively home-dec weight. That was fine by me; back then, I sewed exclusively bags and items for my new house. Now, years later, I can add quilter to my sewing resume, and I’m pleased to work with a lot of AB’s quilting-weight cottons. But home-dec yardage and scraps from projects past still lurk in my stash, and I rarely know what to do with them. While plotting a bag for Audrey, a fellow quilter who blogs at Hot Pink Quilts, it occurred to me to consider those long-neglected home-dec fabrics. Here’s the final product. 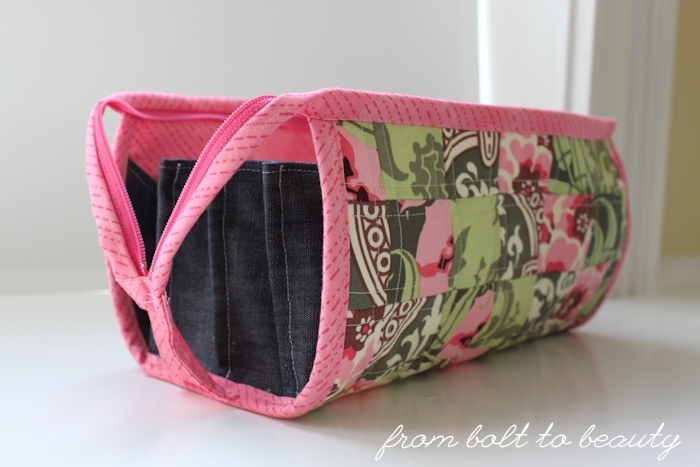 It looks suspiciously like a Sew Together Bag, doesn’t it? 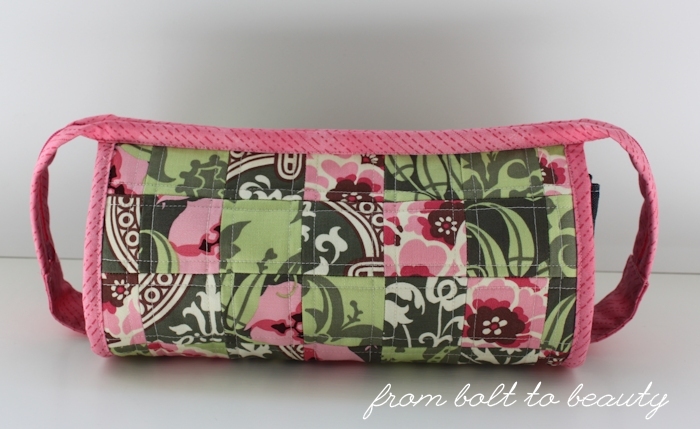 Admittedly, the easier plan would be to hit my LQS for some new Tula fabrics. Audrey has a soft spot for Tula. She also likes bold colors and large-scale prints. I found three different coordinating prints from AB’s Nigella line in my scrap bin, though. They weren’t a slam dunk for Audrey, but I was willing to take a chance and see where these fabrics took me. My first task was assembling the bag exterior, and I was thinking patchwork. By getting creative with my cutting, I made it seem as if I was working with a greater variety of fabric. I think it works! Deciding on the interior fabrics was harder. I would have to supplement the fabric on hand with a coordinating print or two. The challenge is that AB has a distinctive design aesthetic, and her home-dec fabric has a sheen and substance that quilting cotton doesn’t. I didn’t want to wimp out and use solids, but I wasn’t sure what my other options might be. 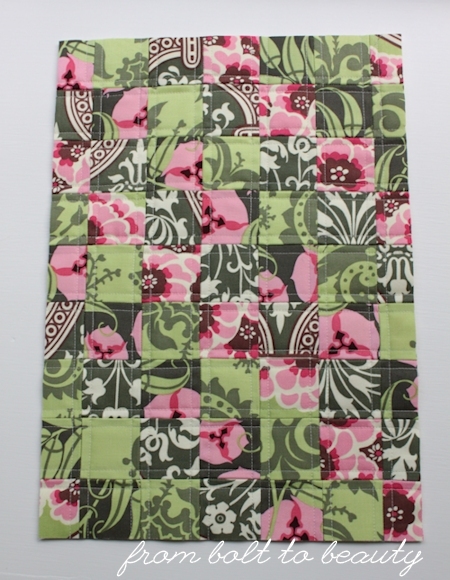 I ended up adding a pink from Basic Grey’s Fresh Cut line, a quilting cotton, to the mix. I considered toning down the palette with a denim (too blue) or a linen (too blah) until I realized I had some of the denim-linen blend left over from my Cargo Duffle Bag. Yes, please! The result is girlie and summery. It reminds me of cut-off jeans and halter tops and handkerchief-wrapped ponytails. It’s not how I envisioned this bag in the beginning—it’s funny how each decision in the process of creating can take you closer or further from your original plan—but I like it. And as the lone female in her household (oh, how I can relate! ), Audrey may need an infusion of girliness right about now. 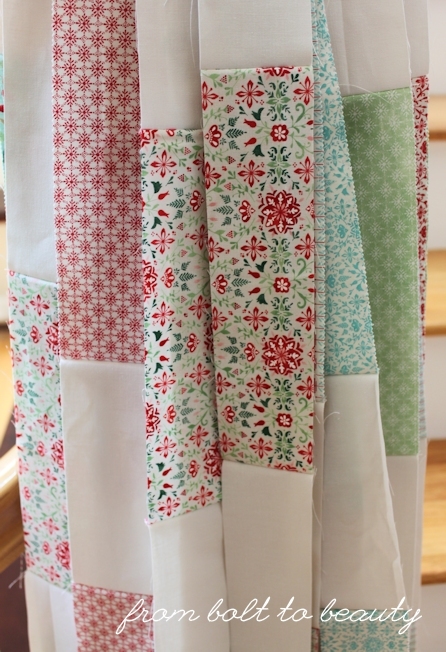 Even after this project, I have sateen—both yardage and scraps—hanging around my sewing room. I’m plotting a big ol’ beach bag with some of that fabric (the pink Scrumptious I recently scored on sale will line that project), but I’d love to hear your suggestions on what I might do with the rest of it. Thanks in advance for your suggestions!